The Georgia Aquarium is the world’s largest aquarium with more than eight million gallons of water and more aquatic life than any other aquarium. The exterior of the building was designed to look like a giant ship breaking through a wave. As guests enter the huge atrium inside the building, they are led into the facility by a “wall of fish.” They then have the choice of entering five galleries. Each gallery is easily identified by an icon and signage at the entrance: Georgia Explorer has a lighthouse; River Scout displays a cascading waterfall; Cold Water Quest has an ice-covered cliff; Ocean Voyager offers a peek window into the huge habitat; and Tropical Diver has two video screens displaying the perspective of a fish on a reef. After traveling through one gallery, guests return to the main atrium before entering the next gallery. 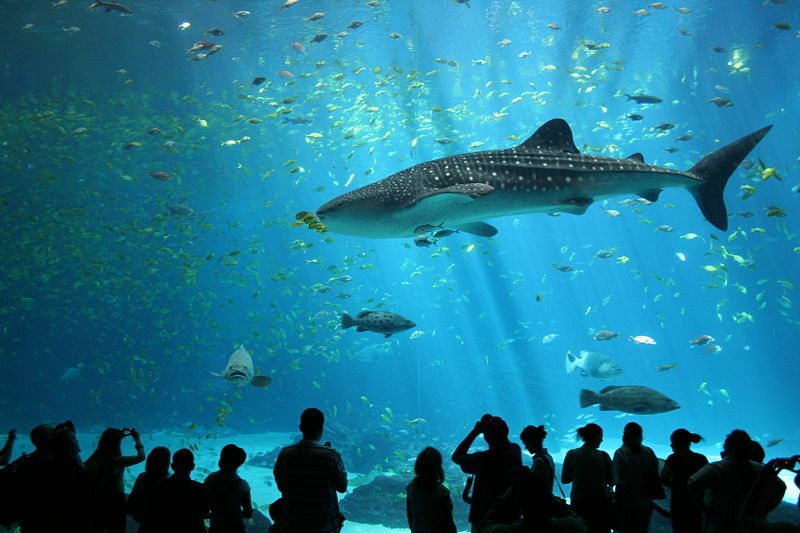 There are 60 exhibits at the Georgia Aquarium with 12,000 square feet of viewing windows. The acrylic used in the windows weighs a total of 328 tons. The largest exhibit holds 6.3 million gallons of water and measures 284’ long x 126’ wide x 30’ deep at its largest points. It was specially designed to house whale sharks alongside tens of thousands of other animals that typically live along a coral reef and out to the open ocean. Georgia Aquarium boasts a 100-foot long tunnel and one of the largest aquarium windows in the world with views into the whale shark habitat. The second largest habitat, 800,000 gallons, was specially designed to simulate the natural habitat of beluga whales. Great information! I yet not visit this aquarium but thanks to you for sharing the information about it. I have visited this aquarium and really one should visit this place once just amazing it is.